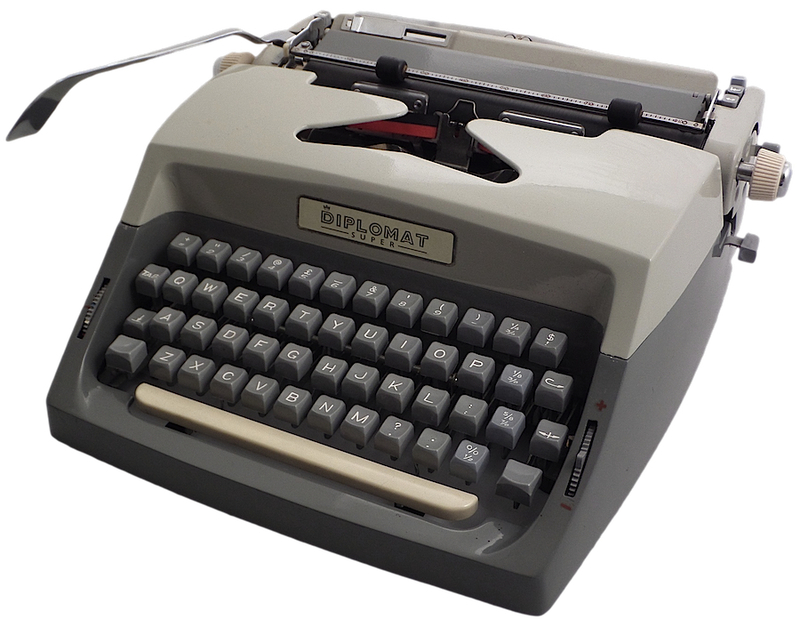 The Diplomat Super is a Czech-made machine that was sold in the United States in the late 1950s and early 1960s. 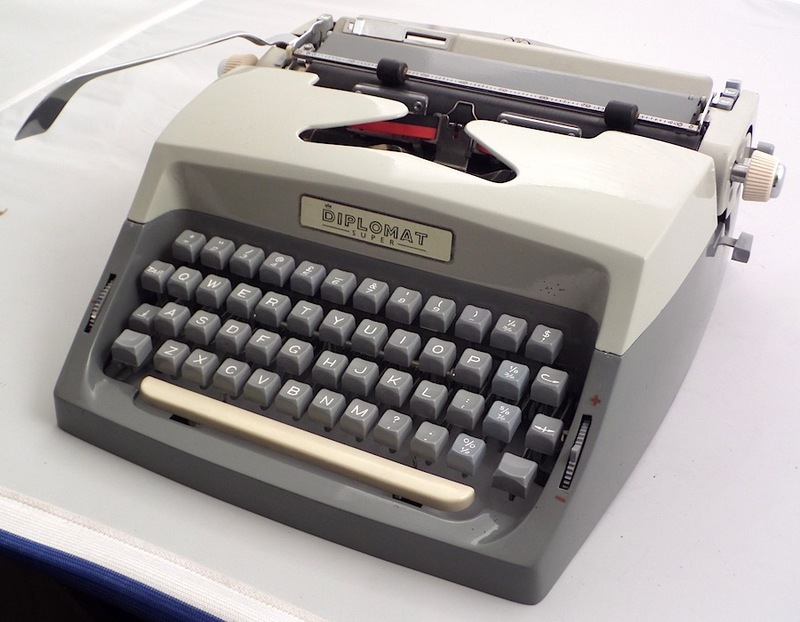 Manufactured by Consul in Czechoslovakia, it is distinct in that the carriage is removable, presumably so that typists could swap it for carriages of varying widths. 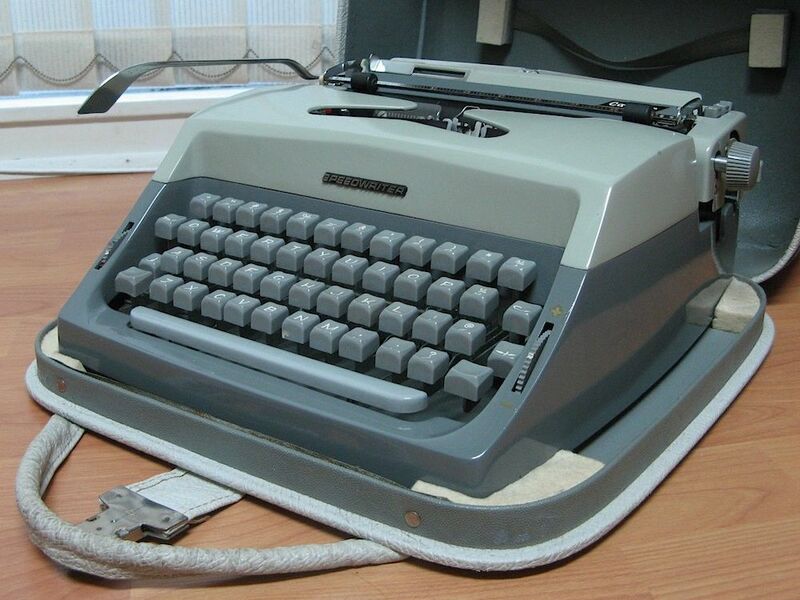 The same machine was also sold as the Norwood, Commodore and Consul. Click image to enlarge. 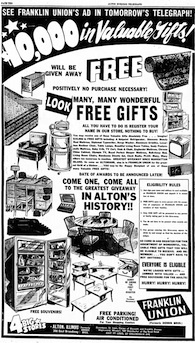 The Diplomat is featured near the middle left of the advertisement from Alton Evening Telegraph (Alton, Illinois), Jun 3, 1958. My machine, displaying the Zeta label (Consul’s earlier corporate name), appears to have been manufactured in 1960 or thereabouts. According to various sources, the date of the machine can be determined by the first digit of the serial number. The number on mine, which is stamped on the underside of the machine, is 224023712. I gather that the first three digits are a prefix, indicating the 224 model in the Consul line, and that the last six are the actual serial number. 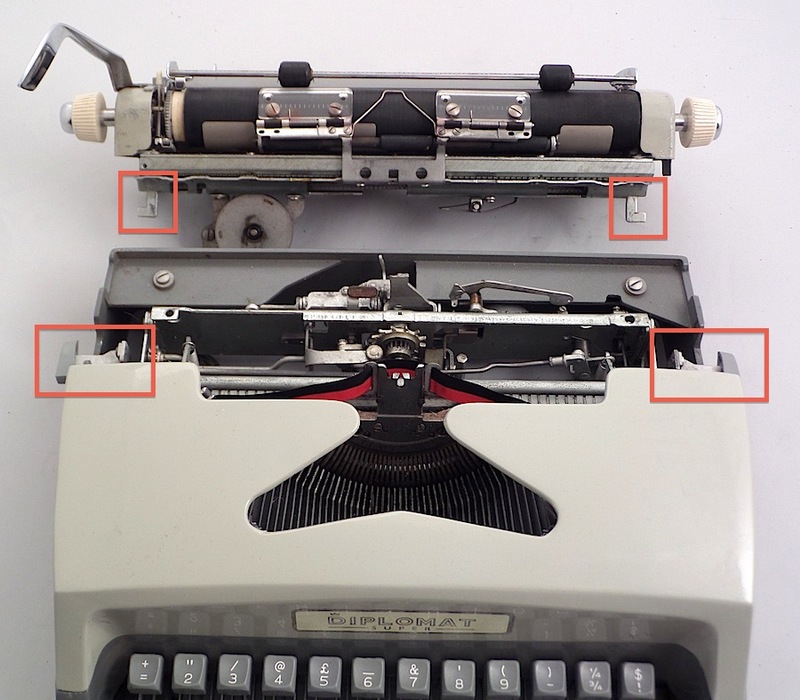 The same is affixed on the detachable carriage, though the first three digits (224) are printed, while the last are hand written.2 I’ve located one advertisement that dates this machine to as early as 1958 (see image left). 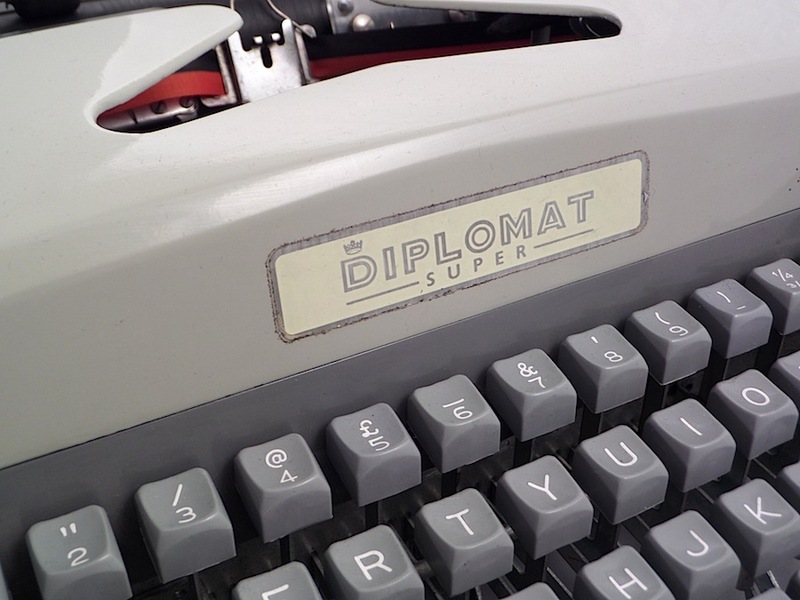 A smaller, more compact version of this typewriter was also labeled “Diplomat Super,” so I gather that “super” does not indicate a deluxe model. The keyboards on both machines include the £ and $ signs, suggesting an international market. 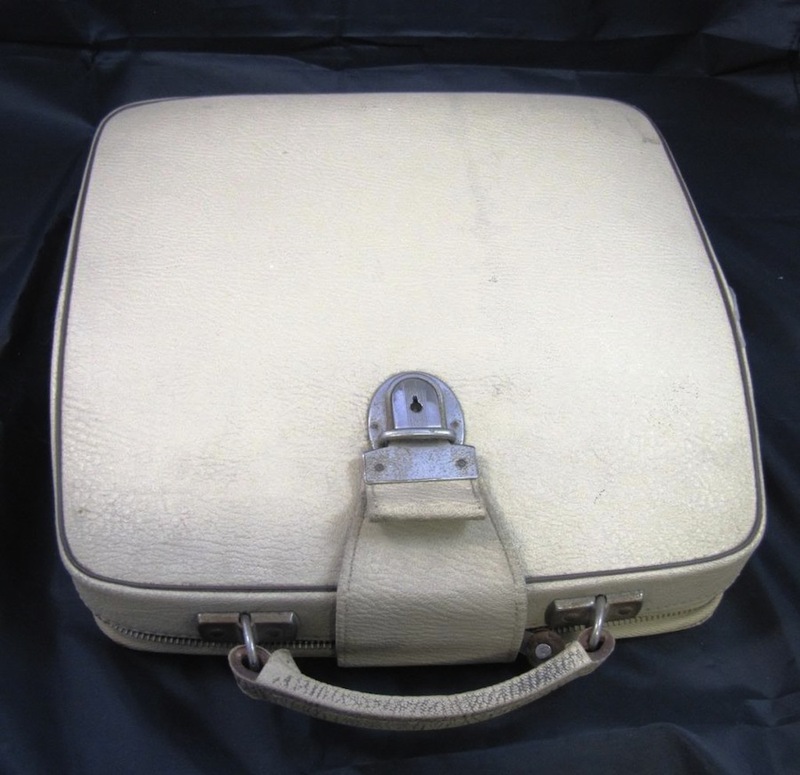 A more detailed history of the Consul line can be found at Messenger’s blog (see here). 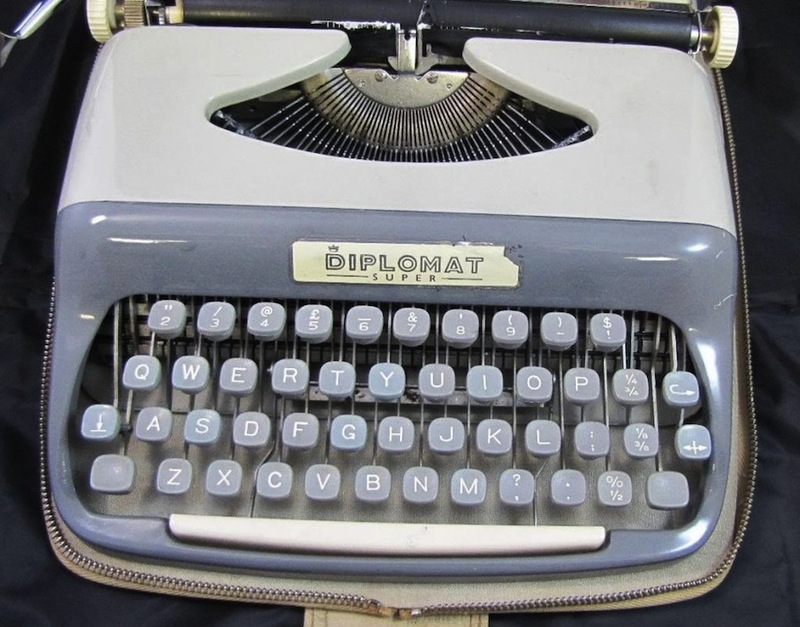 The Diplomat feels like a communist-made machine. It’s blocky, almost excessively so, and weighs more than it really should. Comparably-sized machines are lighter. Yet, for all its heft, it does not feel quite substantial — some components seem fragile. The design of the detachable carriage is somewhat flawed, being easy to accidentally disengage. Two release levers are quite exposed. 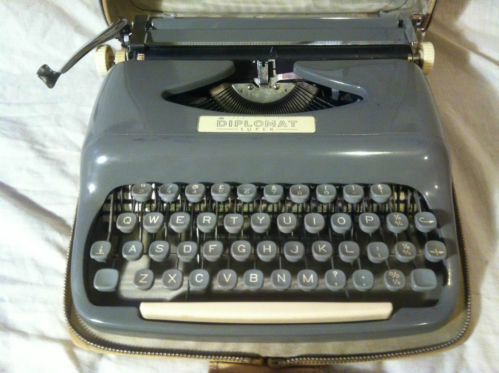 The carriage on Olympia SG3 is likewise interchangeable, but the typist must remove the typewriter’s cover first. Fortunately, the carriage on the Diplomat is easy to reinstall. 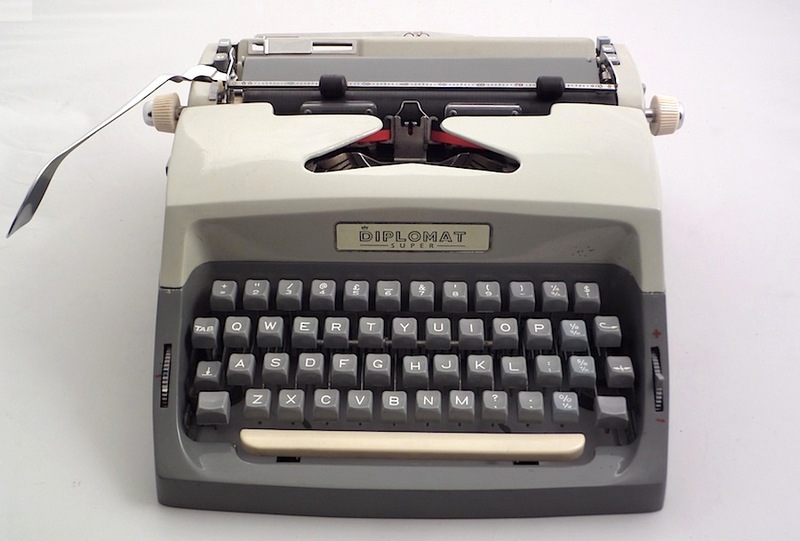 The distinct appearance of the Diplomat is part of its appeal, and, judging from the variety of models offered, Consuls were apparently quite popular. They certainly add dimension to ones collection. 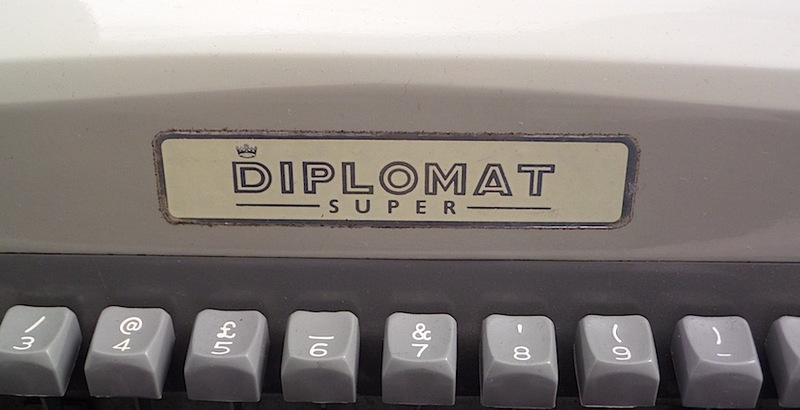 The Diplomat Super with an “international” keyboard (British pound and American dollar symbols). Note the crown above the “D”. The carriage assembly is interchangeable. Using the levers (below), the operator can disengage two hooks (above) for quick and easy removal. Accidental disengagement seems one flaw of this design. The serial number is stamped on the underside of the machine, but also printed on a sticker on the detachable carriage. 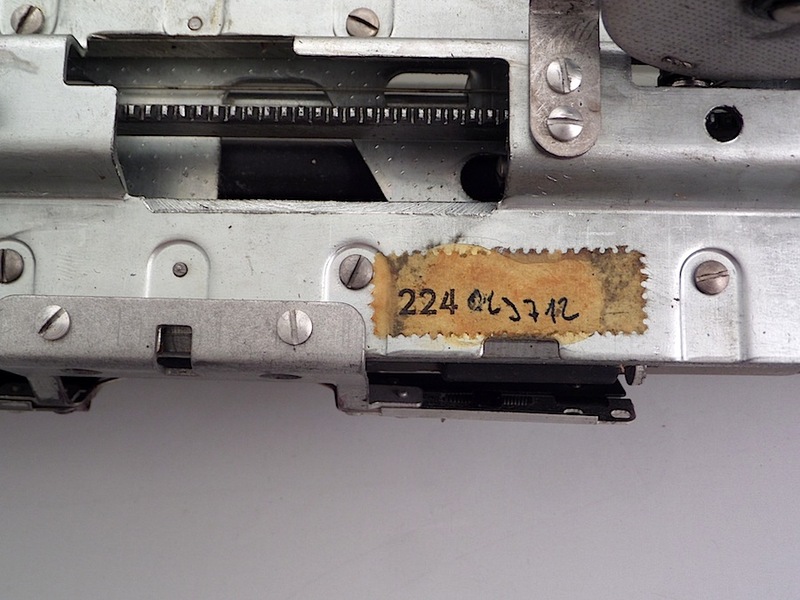 Note the prefix “224” is printed; the serial number is handwritten. Machines of Loving Grace offers an interesting overview of the detachable carriage here. Note £ and $ on keyboard. 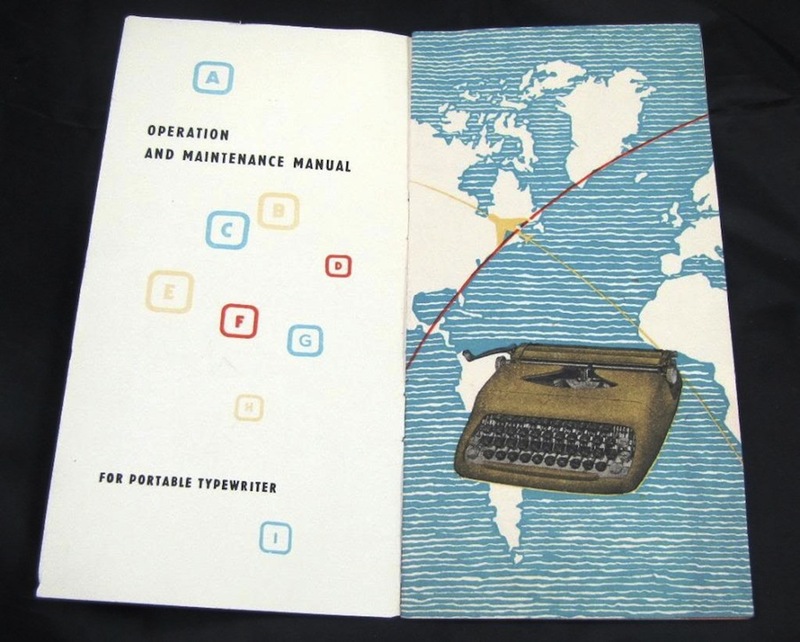 Generic operating manual for Consul typewriters. 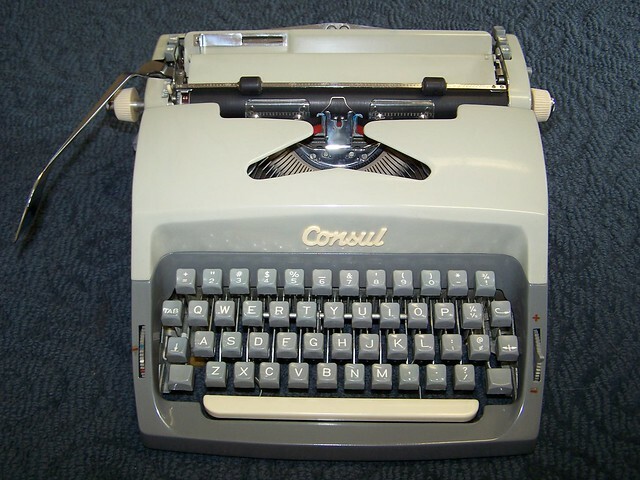 Anyone know what Consul this machine corresponds to? Not certain if the carriage is removable. 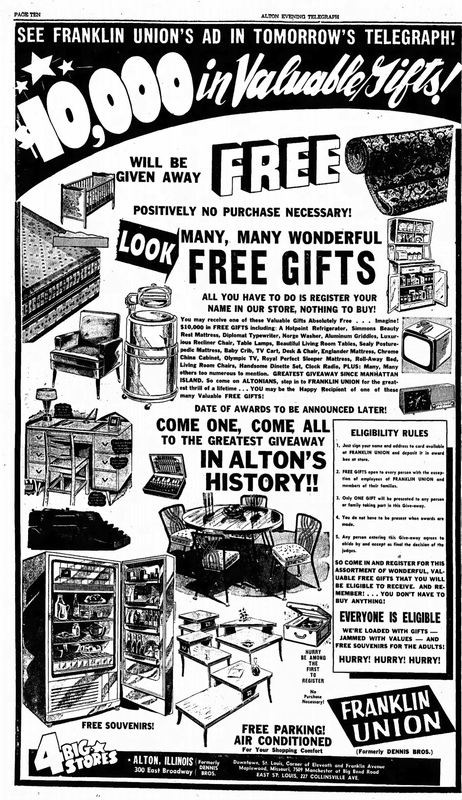 “Cavalier” appears on the paper table (not visible in this photo), and Commodore appears on the back. I am so drawn to their looks though. Pretty much every Consul ever made is distinctively beautiful. 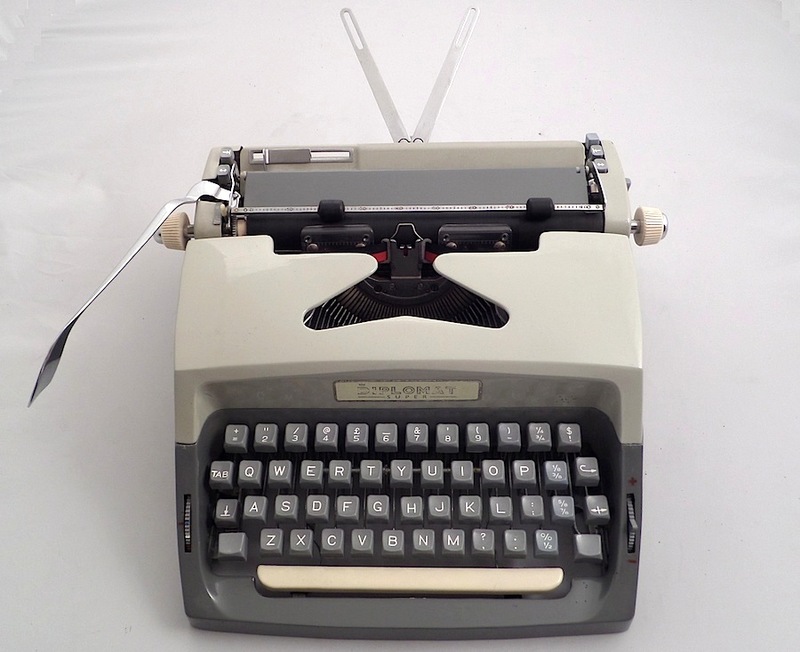 Well, I got it out and put a ribbon in, and I’m actually quite pleased with how it types. From what I understand, the models that were made in the style right after yours were the best (of which mine is one). As a correction, there are actually not places in the body for the levers. When I first got this I actually was looking for the levers, so my memory switched reality there. Neat. I hadn’t seen the Diplomat name before. The little Diplomat is a Consul 232.